Are you guys into juicing? After watching the film Fat, Sick, and Nearly Dead on Netflix, I was definitely intrigued by the narrator’s journey to better health through juicing. But somehow I never got around to trying it out. 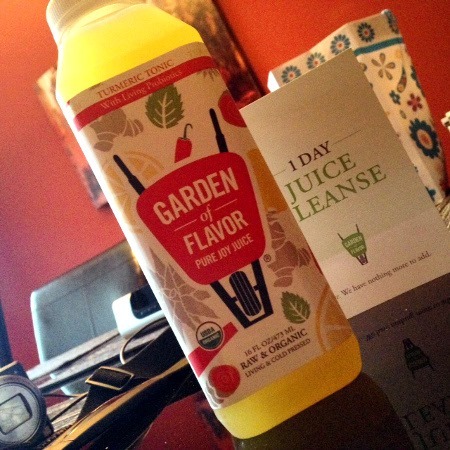 Having been curious about juicing for a while now, I jumped on the chance to try out a 1 Day Juice Cleanse after being contacted by the folks over at Garden of Flavor. Sounds fun, right? I think so. I like trying new things. To get things started, I headed over to Hiller’s Market on Washtenaw Ave in Ann Arbor to pick up some juice! 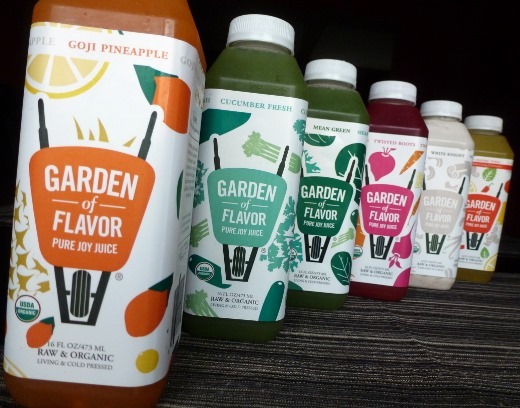 Garden of Flavor’s juices can be found at other locations around the Midwest as well, and you can find a list of locations here. According to their Facebook page, this Cleveland-based company will soon be offering overnight shipping around the country as well. 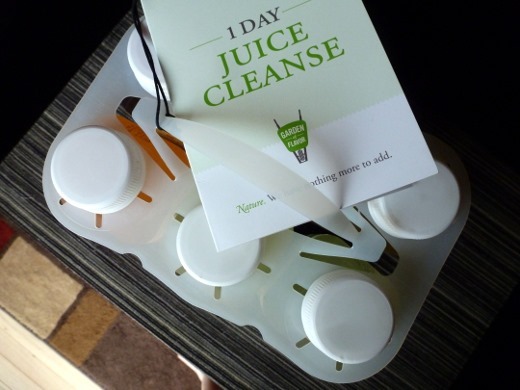 The juice is available in single bottles, or in these handy dandy six packs, which comprise the One Day Cleanse. Here are the juices! Aren’t they beauties? The juice labels also are conveniently numbered #1-6, in the suggested order of consumption. Each bottle has a unique nutrition label, indicating the calorie content. If all six juices are consumed in one day, they provide approximately 1200 calories. So let me tell you about my experience! I drank a mug of hot water with a squeeze of fresh lemon, per Garden of Flavor’s suggestion. 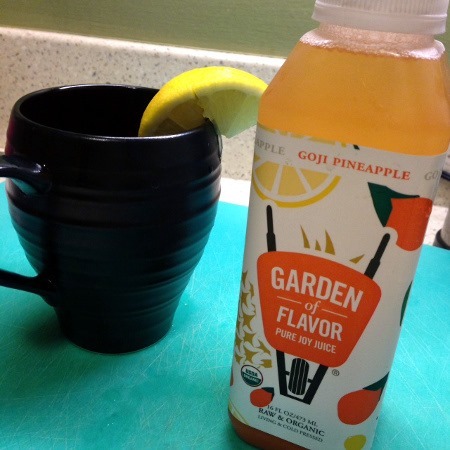 When I got to work I drank my first juice, Goji Pineapple. It was the sweetest of all the juices and had an energizing ZING! I liked it. Also I should mentioned that I skipped coffee on this day. I love (LOVE) coffee, and drink it daily, but I have no problem refraining from it if and when needed. (I guess I’m lucky, because I know a lot of people suffer from caffeine-withdrawal headaches.) Refraining from coffee is not required, from what I understand, but it is suggested, if possible. If you feel that you’d suffer from quitting coffee from the day (caffeine withdrawal), then at least try to reduce the amount of coffee you consume, and skip the artificial sweeteners. Drank Juice #2 at my work desk: Cucumber Fresh. This juice is a blend of cucumber, celery, parsley, and lemon juice, and it was probably my favorite. So light and crisp, with lots of grassy parsley flavor. Definitely getting hungry for lunch, so I pulled out Juice #3, Mean Green, created from over five pounds of certified-organic leafy green veggies! 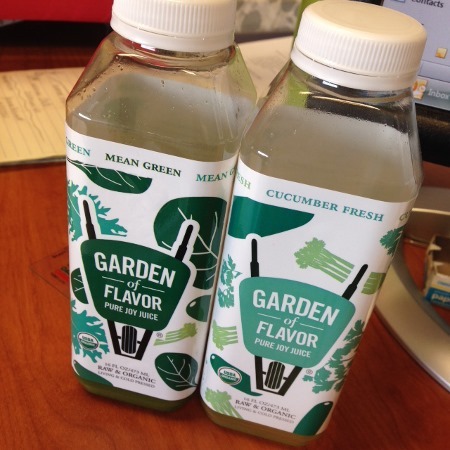 The taste was somewhat similar to the Cucumber Fresh, but with less of the grassy parsley flavor. Quite mild. My stomach quit rumbling for a while after this. Still feeling good at this point. After sitting in my boss’s candy-filled office (and resisting said candy) I am definitely craving sugar at this point. All I want is chocolate. 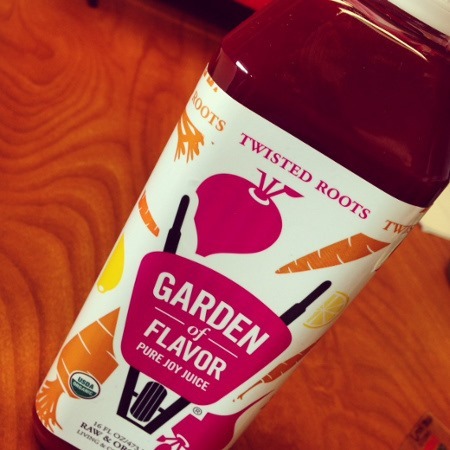 Instead, I pull out Juice #4, Twisted Roots, a vibrant blend of beet, carrot, and lemon juice, providing over 1000% of my daily Vitamin A needs. Wowza. The flavor of this juice was mildly sweet and very earthy. I liked the mouthfeel of this juice especially, in that it was thicker than the previous juices, and felt more substantial. This satisfied me for another hour or so, but then I started to feel less mentally sharp, and kind of foggy really, for the last hour of my work day. Arrive home from work. Change into PJ pants immediately. (Obvi.) Debate going through the fast food drive-through. Decide against it. Husband arrives home from a work trip, and brings in a huge feast of BBQ for himself, after a long day of traveling. I make myself not look at the food. I am really hungry at this point! My stomach is rumbling and my energy is lagging. “Dessert in a bottle….alive, raw, delicious and satisfying. 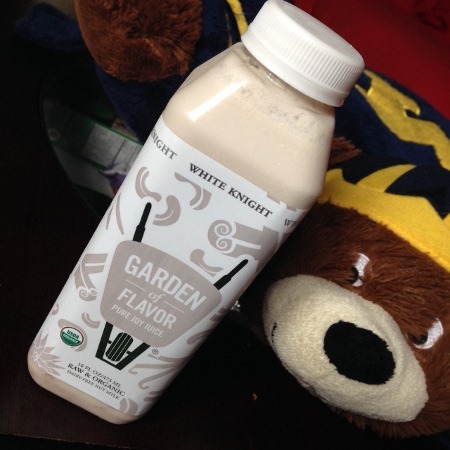 White Knight comes to your rescue after a hard workout or long day at the office. With its creamy, texture and semi-sweet flavor, this cashew nut milk is reminiscent of an old fashioned vanilla milkshake. Just when I’d been contemplating throwing in the towel, this really was my White Knight. This juice is actually a nut milk, made from a blend of cashews, cinnamon, vanilla, and agave nectar. It was very creamy, delicious, and satisfying – as promised! I felt SO much better after consuming the healthy fats and 14 grams of protein in this drink. Juice #5 kept me satiated much longer than any of the previous beverages. Time for my final juice! #6 is called Turmeric Tonic, a spicy lemonade revved up with cayenne, ginger, and turmeric root. Additionally, probiotic cultures are added to promote digestive health. Lots of flavor in this juice and I am a fan. Very spicy, and a bit sweet too. I am exhausted at this point (probably a combination of having gotten up an hour earlier than usual this morning, and also from the lack of food), and my head kind of hurts, so I go lay down in bed and read Game of Thrones until I fall asleep, probably just shy of 10:00 PM. (Usually I go to bed around 11:30 PM). Here are the questions I would have liked to ask someone before my cleanse, so here is some additional info! The stretch from 3:30 PM – 5:00 PM (between Juice #4 and Juice #5), yes, I was very hungry. Borderline hangry. The rest of the day, I was fine. Did you have to stay by the bathroom? Nope! But my bladder got a work out after consuming 96 oz of juice; but no other issues. Delicious! I really enjoyed all the flavors. Admittedly, the juices are pricy, but when you take into consideration that it requires over 20 pounds of organic product to make them, the price seems much more justified. They are made from a large volume of wholesome ingredients and it would expensive to make these juices at home as well. I’m really glad I tried out a 1 Day Cleanse and proud of myself for sticking to it. Half the reason I wanted to try it out was simple curiosity - just to see if I had the willpower to make it through the day (and I did!). I would recommend that anyone try it out, at least once! I’m not sure if I’ll do a full 1 Day Cleanse again soon, but I could see myself replacing (or supplementing) a meal or two a few times each month with a bottle of fresh, cold Garden of Flavor juice. This would especially be practical on busy work days when I don’t have a lot of time to sit and eat lunch. While my main goal wasn’t to lose weight (though I can see how juice fasts could be an effective way to kick start a weight loss plan), I was curious to see if I would lose any weight. Between the morning before beginning my Juice Cleanse and the next morning, I lost 2.0 pounds. Hope you enjoyed hearing about my experience! 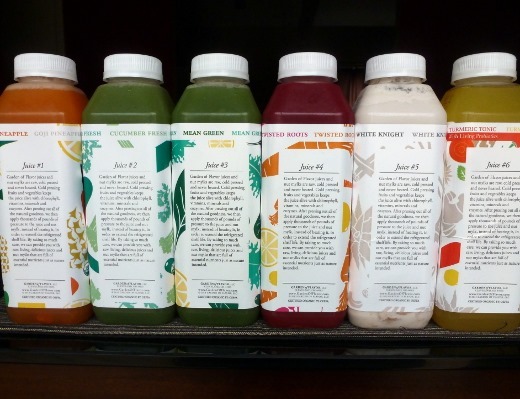 At the Ann Arbor location, it is about $7.49/bottle for the 1 Day Cleanse. Seems about on par with other juices I’ve seen, in terms of cost! Intriguing for sure! I did the 10 day lemonade cleanse and posted on it a coupla months ago. What I found is that after a few days you get in a groove and you have high energy and no hunger. Probably same here. Babo Market had been selling a lot of juices and this sounds similar to their program. They have 3 5 and 7 day programs that avg out to $30 a day. Still pretty expensive. There’s also a 3-5 day cleanse at Whole Foods, some of the juice blends sound eerily the same (and cashew nut may be exactly the same) but the order you drink them is different. It’s called Blue Print and I think it’s about $120 for 3 days. I’ve only successfully completed it once but I do like swapping out breakfast for their cayenne lemonade or green juice. Oh nice, good to know! Awesome! I really think their juices taste great. Would love to hear how your day goes!